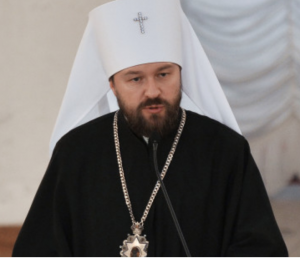 Participating in a London conference on the topic of “The Christian Future of Europe,” Metropolitan Hilarion Alfeyev, head of the External Relations Departments of the Russian Orthodox Church, Moscow Patriarchate, spoke on September 22 at the Russian Embassy to Great Britain, and his talk was something of a warning to the Churches of the West. Opening his talk with an acknowledgement of Christian persecution throughout the world, and armed with research figures hewn from recent PEW polls and other studies, Hilarion painted a grim but up-to-date and accurate picture of what Christianity is currently facing due to migration and Western secularization, and also what the future of Christianity will look like without a deep and strenuous effort at evangelization. I would like to remind you all that in Russia before 1917 nobody ever proposed that the collapse of a centuries-old Christian empire would happen and that it would be replaced by an atheistic totalitarian regime. And even when that did happen, few believed that it was serious and for long. The modern-day decline of Christianity in the western world may be compared to the situation in the Russian Empire before 1917. The revolution and the dramatic events which followed it have deep spiritual, as well as social and political, reasons. Over many years the aristocracy and intelligentsia had abandoned the faith, and were then followed by common people. “The fundamental rupture in the traditional way of life – and I am now speaking … of the spiritual and cultural self-consciousness of the people – was possible only for the reason that something very important had disappeared from peoples’ lives, in the first instance those people who belonged to the elite. And when half a century after the creation of the European Union its constitution was being written, it would have been natural for the Christian Churches to expect that the role of Christianity as one of the European values to have been included in this document, without encroaching upon the secular nature of the authorities in a unified Europe. But, as we know, this did not happen. The European Union, when writing its constitution, declined to mention its Christian heritage even in the preamble of the document. I firmly believe that a Europe which has renounced Christ will not be able to preserve its cultural and spiritual identity. The Archbishop’s full speech may be read here.